Is The Elder Scrolls: Legends a card game for Elder Scrolls fans, or is it the other way around? Yes, it’s quite a bit like Hearthstone. No, that doesn’t matter in the slightest – modelling your game after one of the most popular CCGs of all time is generally a good idea. 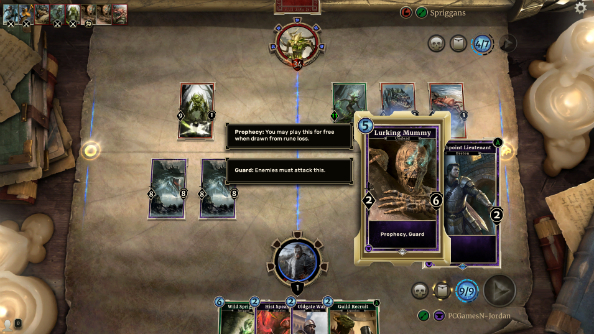 To that end, The Elder Scrolls: Legends is a fascinating evolution on Hearthstone’s monumentally successful formula, adding new systems, significant depth and enough character to make it feel like its own beast. 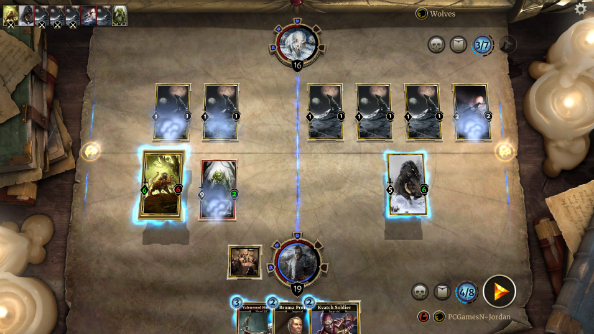 Lanes, a staggering wealth of cards, and the potential for complex combos and plays have taken The Elder Scrolls: Legends to virgin territory: It’s not just a card game for Elder Scrolls fans, but neither is it solely an Elder Scrolls game for card game fans. Into this game’s source material? You’ll enjoy PCGamesN’s selection of Skyrim’s best mods. Developed by Dire Wolf Digital – who claim a number of ex-pro Magic players among their ranks – TES:L isn’t short of complexity or depth. It’s absolutely brimming with both. That depth comes from the combination of two features: lanes and card classes. Lanes have quite a literal impact on the game board, physically splitting it down the middle. You’re almost always required to focus on both lanes, but knowing which lane to place a card in, how you want to weight the number and type of cards in each lane and when to switch your approach is instrumental in winning a game. The lanes aren’t identical, either: the Shadow Lane (right-hand side) is differentiated by the fact that cards placed there are cloaked for one turn. That means you can place vulnerable cards there, no matter what the opposition, and play them on the next turn unhindered. The left-hand side is the Field Lane, and offers no alteration to gameplay. The Field Lane is the ideal space for direct confrontations. It’s the lane you’ll want to overcrowd, brute-force and keep on top of. Conversely, the Shadow Lane is more versatile, offering a safe-haven for complex plays, heavy-hitting but vulnerable cards and weaker creatures. You’ll want to have cards playing in both lanes, but while the Field Lane is where most of the action unfolds, the Shadow Lane harbours the potential for back-breaking moves and last-minute assaults. That means plenty of nail-biting and thrilling moments as you attempt to change the status quo of a match with a single play. For instance, by playing a Bog Lurcher in the Shadow Lane against an opponent with a formidable Field Lane I’m able to edge my way back into the fight. With an incredible nine attack, but only a paltry one defence, the Bog Lurcher would have been decimated in the Field Lane, yet in the Shadow Lane it’s granted immunity, allowing me to deal a near-fatal blow to my opponent. The result is an awkward fist-pump and celebratory clap that I immediately retract. Oh, and I’m also able to overload the Shadow Lane and win the match in the following turn, which is great too. Moreover, those lanes aren’t entirely separate. Certain cards have buffs and abilities that can be applied to enemies and companions in the other lane, or in some case, both lanes. In short: you won’t get very far if you’re only concentrating on one lane, no matter how much damage you can deal. There’s also direct damage to take into consideration, which can be enacted through action cards that instantly harm or add an effect to either your overall health, your cards, or the enemy and their cards. With no way of guaranteeing which cards you draw there’s no sure-fire way to plan ahead, meaning you’ll have to be juggling all of these factors and potential outcomes as you play the game. Those subtle differences become especially important when playing with different card classes, decks and strategies. For instance, decks made up of Strength and Willpower cards will often fair better in the Field Lane. Why? Their effects and abilities can be exploited by dealing damage to any enemy cards in the lane, or by simply going after your opponent directly. In the Shadow Lane though, it’s the Intelligence, Endurance and Agility classes who reign supreme – they’re often weaker, but can throw a diverse array of punches, from stealing life and buffing allied cards to dealing instantly lethal damage and stopping enemy cards from moving for a turn. There are also key card types like Guard and Charge that fundamentally alter the ebb and flow of each match. Guard cards, for example, have to be destroyed before anything else can be attacked, which can buy you vital time while contesting a lane or completely halt an enemy onslaught, if only for a turn or two. Charge cards offer the opposite, allowing you to attack instantly instead of having to wait a turn – an ability that can be crucial in taking out particularly tricky enemies. That doesn’t even scratch the surface when it comes to the number of cards and variables, and yet The Elder Scrolls: Legends caters excellently to players who’ve never played a card game in their life. 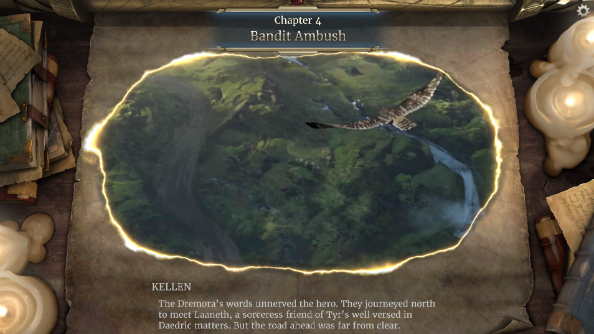 Anyone with a basic grasp of adding and subtraction will breeze through the campaign’s first act, which serves as a tutorial, before encountering more difficulty as you go up against more combo-based playstyles like Agility and Endurance. From here, each new match in the game’s lengthy campaign is a proper contest and any semblance of this game being catered to genre newcomers quickly falls away. While Dire Wolf Digital have clearly built on Hearthstone’s foundations, they’ve also emulated one of its greatest strengths – providing players with satisfying feedback for absolutely everything they do. Much like in Hearthstone, every facet of the game is brimming with animations, glowing lights and base-laden audio that loads each victory, prize and even click with some level of meaning. Considering it’s in beta at the moment, it’s also far more polished than Hearthstone was even after launch, with a full campaign, innumerable cards and not a single bug to speak of. So far. Similarly, working through the campaign will rain currency, cards and packs down on the player, which adds valuable incentive to every match, win or lose. 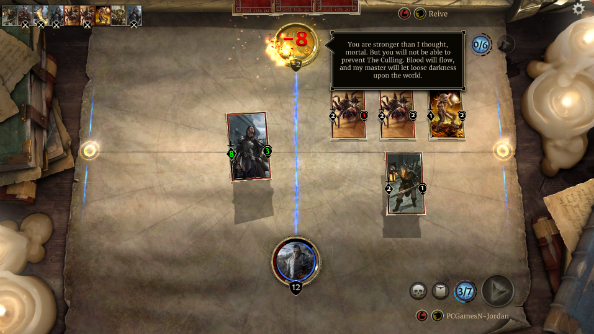 After a full afternoon with TES:L I never wanted to stop playing – there were always more cards, more gold and even entirely new decks to unlock with every victory. So that leaves TES:L in an awkward place: it’s a really great card game, but it’s not very much of an Elder Scrolls game. The cards have plenty of franchise heritage and fanfare, but the narrative, however polished, lacks punch or purpose beyond introducing players to the game’s mechanics. It visits all the places you’d expect it to but it makes little of your time there beyond some contrived new board mechanism like a having cards switch lanes to simulate your being on a ship. Of course imbuing a card game with anywhere near as much atmosphere as the open-world RPGs of its namesake is no mean feat, but the campaign feels very much like a store-bought fantasy narrative re-skinned with Argonians and Daedra. 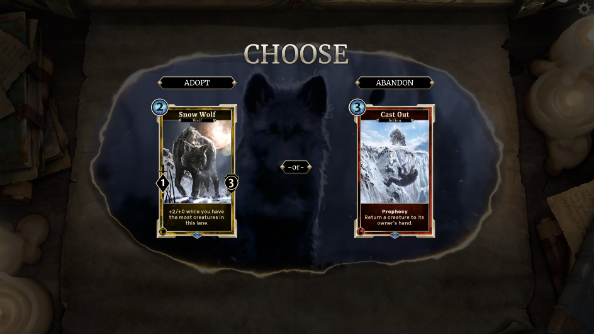 Dire Wolf Digital have also tried to give the players meaningful narrative decisions to make, letting the player choose one of two outcomes, each of which rewards the player with a different card. 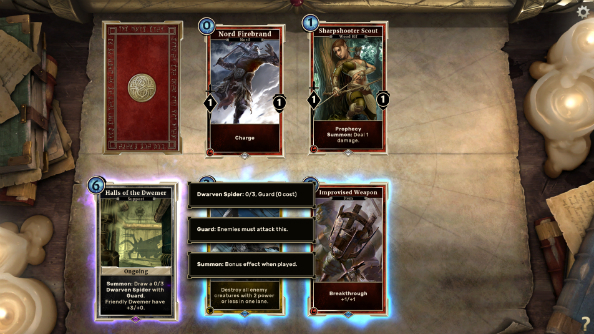 It seems like a nod to the decisions players get to make in the Elder Scrolls games, but it’s only occasional that the reward cards offer any standout gameplay value to match. Fortunately, none of that detracts from how engaging the core gameplay is. With a multitude of new decisions and micro-calculations with every new card that’s played, every moment is a feverish rush to stay in the game – dealing a barrage of damage directly to your opponent after a particularly dominant streak is endlessly satisfying. The Elder Scrolls: Legends is clearly a game made by people who know card games inside and out. Its web of mechanics and variables encourages mastery, from building a versatile deck to learning how to best exploit chinks in your opponent’s armour. Despite the well-integrated lore, this isn’t really an Elder Scrolls game, but if that license brings fans to Legends, there’s a good chance they’ll stick around. TES:L is currently in closed beta, and is due out later this year. Click here to sign up for the beta.